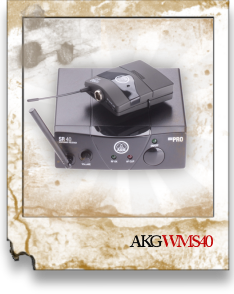 The WMS40 Mini wireless microphone system provides crystal clear sound and is a true plug'n'play solution. Up and running in a second, it is the optimum wireless solution for small stages, clubs, places of worship, hotels, and gyms. The system is available in different application optimized set packages, all of which includes a universal, switched mode power supply for worldwide operation.